Say goodbye to takeout! 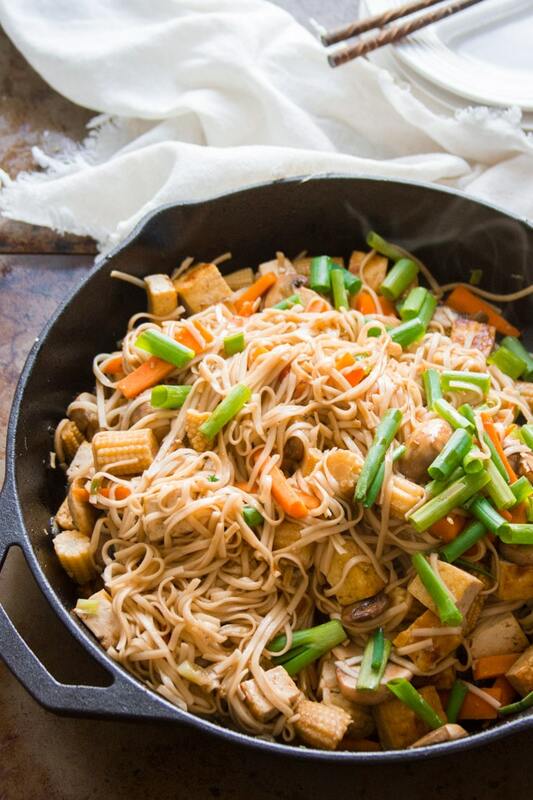 With slurpable noodles and stir-fried veggies in a flavor-packed sauce, this vegan lo mein will be your new favorite weeknight dinner. Did you guys have a long weekend? I did! I cooked, hosted brunch, and a good time was had by all. Whether or not you had a long weekend, it is Monday. And Monday always has me in weekend withdrawal, scrambling around to figure out what I’m going to eat. That’s why I love recipes like this! 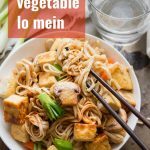 I’ve eaten a lot of lo mein in my day (it was my favorite during my early vegetarian years!) and I think I’ve perfected my own personal recipe. Guys, this lo mein is delicious, and it’s super easy. So give it a try this week. Start by prepping everything. Chop the veggies, mix the sauce, and boil the noodles. You’ll want all this stuff ready to go when you need it. The tofu is the first thing to go into the skillet. You’ll need to pan fry it using this technique to get a nice crispy coating on the outside. Take it out of the skillet and plate it when it’s done. I always loved those little straw mushrooms in my takeout lo mein, but I can never find them, so I went with plain old white button mushrooms. And you know what? I liked them better. Brown the mushrooms in the skillet, and then transfer them to the plate with the tofu. Next comes the stir frying! Garlic and ginger first, then veggies for a couple of minutes, then the sauce and noodles. 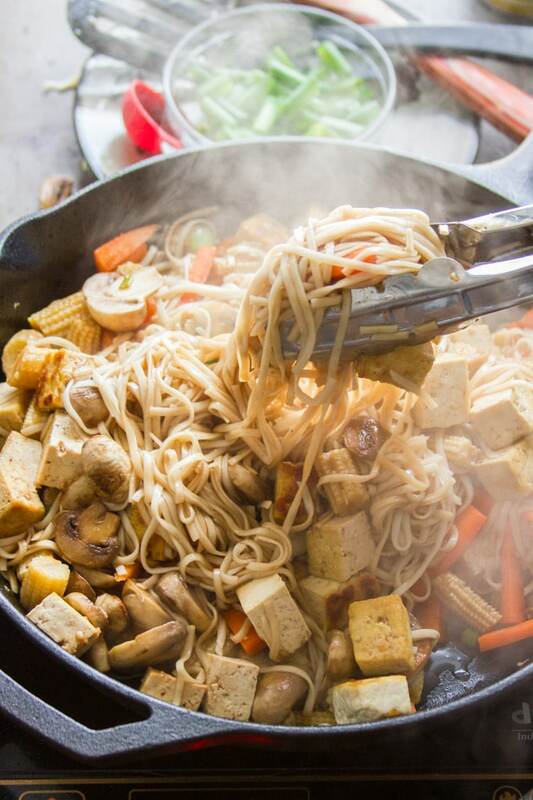 You can return the tofu and mushrooms to the skillet at this point too. You’ll need to work quickly during this last stage of cooking, which is why it’s so important to get the prep work out of the way in the beginning. And that’s it! I loved this more than any takeout lo mein I’ve ever had. Check the ingredients on your noodles! Not all brands are vegan. Roland and Ka-Me brands are both vegan. As a last resort, use regular old spaghetti — it works just fine! 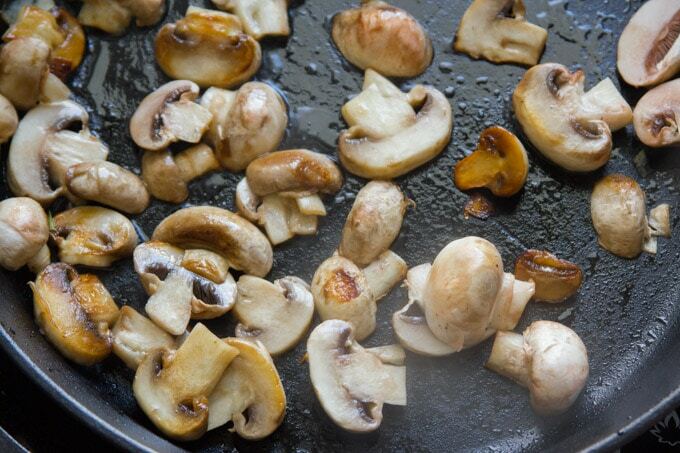 Clean your mushrooms by wiping them with a damp cloth. Don’t rinse them or they’ll get water-logged and won’t brown. And on the topic of mushrooms, resist the temptation to stir them while cooking. Just let them sizzle in the skillet for about 5 minutes on each side. This is how you’ll get them nice and browned. 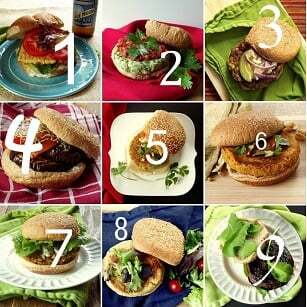 Feel free to switch up the veggies with your favorites. Baby bok choy, napa cabbage, broccoli, bell pepper, snow peas…they’d all be awesome in here. Adjust the sauce to your taste. Like it a little saltier? Add some more soy sauce. Sweeter? More brown sugar. And there’s always room for more garlic and ginger. Bring a medium pot of water to a boil. Add the noodles and cook according to the package directions, just until al dente. Drain the noodles into a colander and rinse with cold water. Return them to the pot. Stir the sauce ingredients together in a small bowl. Coat the bottom of a large skillet with 1 tablespoon of oil. 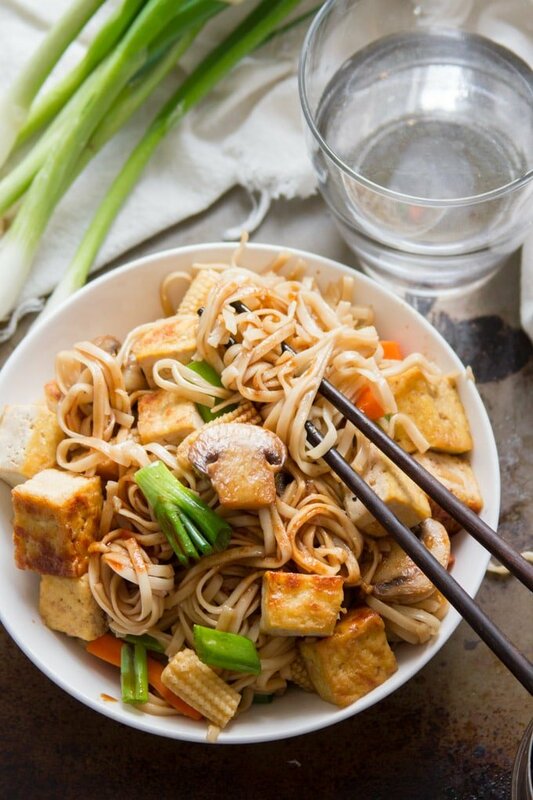 When the oil is hot, add the tofu. Cook for about 10 minutes, flipping once or twice, until the pieces are browned on multiple sides. 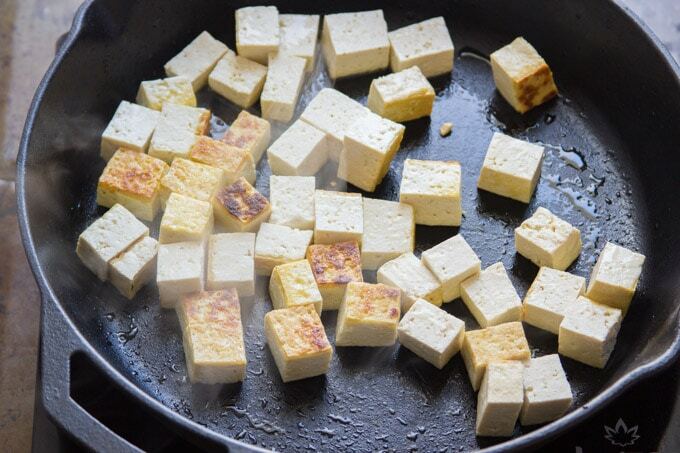 Transfer the tofu to a plate. Add the remaining oil to the skillet. Add the mushrooms in an even layer. Cook for 5 minutes, flip and cook 5 minutes more, until browned on both sides. Add the ginger and garlic to the skillet and sauté for about 1 minute, until very fragrant. Raise the heat to high and add the carrots and baby corn. Stir-fry just until the veggies are tender-crisp, about 3 minutes. Lower the heat to medium and add the sauce to the skillet. Let it bubble for a few seconds. 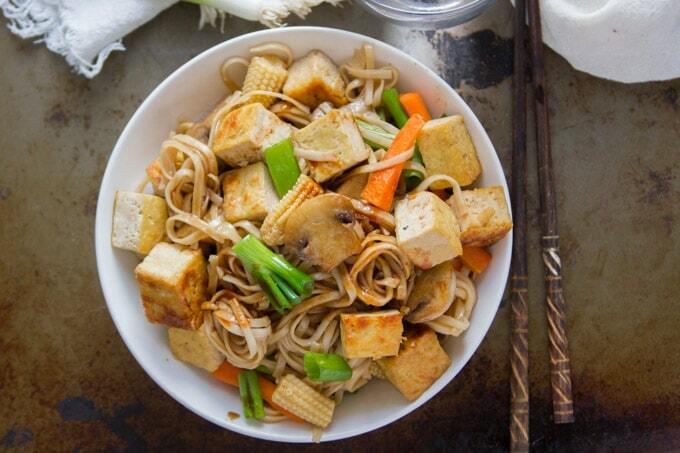 Return the mushrooms and tofu to the skillet, and add the noodles and sauce. Cook, gently flipping, until the noodles are heated throughout and the sauce reduces a bit, about 2 minutes. Remove from heat and stir in the green parts of the scallions. Divide onto plates and serve with additional soy sauce. If your noodles stick together after cooking, give them another quick rinse in cold water and drain them well before adding them to the skillet. For an extra kick, add some sriracha or sambal oelek to the sauce. Made this for lunch today – threw in some snow peas. Snow peas sound like a delicious addition! Glad you enjoyed it! Thanks Elke! This was delicious. Used organic whole wheat linguine and I had sliced portabella mushrooms and used those instead of cremeni or button; did not have baby corn but did have leftover cooked broccoli and used that. Next time I will make 1 1/2 times the sauce.Will definately make this again. Sounds like a delicious meal! I’m glad you enjoyed it! Thanks Sandy!